There are some innovations that we use every day, whose origin hides an extraordinary story. Innovations that in the period of time before they came to light were scarcely known and thought about by even the brightest minds of society. Yet when they arrived, they came fully formed and solved a problem that mankind did not even know that it had. Indeed, this was the case in the story of Harry Beck and the principles that he brought to light in the design of his London tube map in 1932, when, in the moment of its unveiling, all pre-existing notions of how a map like that should be drawn were done away in one clean sweep. The ideas were fresh, out of the box, and so completely made sense, that the basic principles that they brought forth in its creation completely and utterly changed the way that transportation maps were drawn from then on, with its effects reverberating to this day, all over the world. Before Harry Beck, passengers on the London tube relied on a map that was faithful to the topographical landscape of the area it represented, showing the actual positions and distance between different stations. Harry Beck’s great idea was that anyone who got onto a train did not need to know or care about how far their intended stop was or the meandering details of the train’s path. All they needed to know was the stop that they wanted, and how many stations it was down the line from where they got on, in order to know where to get off. This idea spawned a design that was based on a grid system, with adjacent stations roughly equidistant from each other. Graphically simple, and showing all the relevant information that a passenger really needed in plain, straight lines and bright colors, it was a revelation. By paring down the design to only the essentials, its usefulness and aesthetic beauty was elevated to an unprecedented level. Indeed evolution affects processes and dictates that version after version of something is created in a ceaseless improvement that comes from reactions to the environment. Yet there are some instances when a solution comes so fully formed that no further improvement can be made. Such was the case of the London tube map by Harry Beck, and one other design that was invented around the same time, that we use today, essentially unchanged from when its inventor Louis Cottier brought it to the world in 1931. The period of the ’20s and the ’30s in the history of Patek Philippe spawned several early versions of the watches we know and love today in their modern incarnations. The earliest-known perpetual calendar in a wristwatch came in 1925, made from movement no. 97975, which had originally been completed in 1898 to be made into a women’s pendant watch. 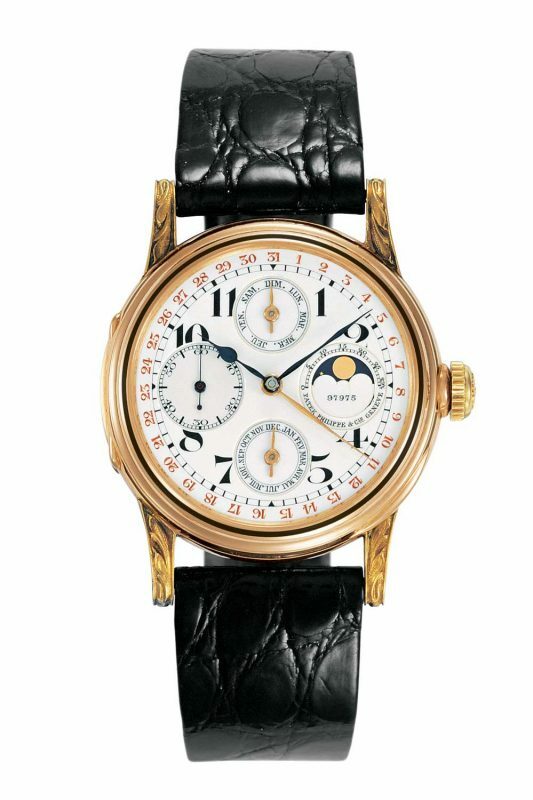 It was not sold at the time, only coming into use when the demand for wristwatches started to take hold, and was used to make the first-ever perpetual-calendar wristwatch, a move that would initiate a position of dominance for Patek Philippe in this particular complication for decades to come. Following this in 1932, the first Calatrava ref. 96 was created, a watch that had been inspired by the minimalist principles of the Bauhaus — a school of thought that preached the principle that form must follow function. The result was a timeless watch in a round case where clarity and legibility were paramount, setting the basic codes of design and purpose, which all members of the collection from then on would follow, and becoming the classic embodiment of what a watch should be. 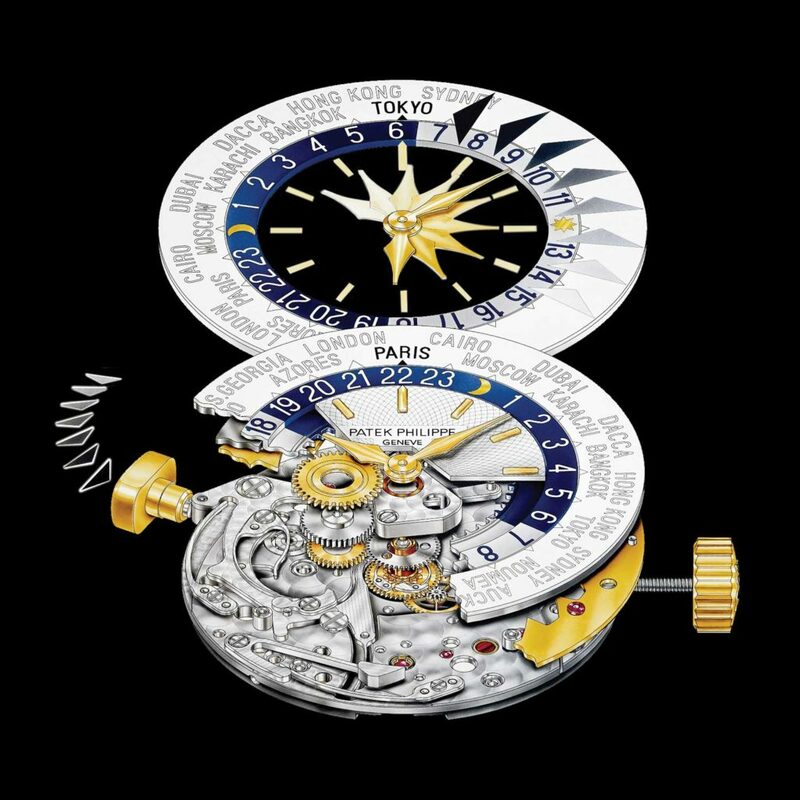 Indeed while the Perpetual Calendar and the Calatrava collections were two of the cornerstone staples in the Patek Philippe lineup that emerged during that time, there was a third collection that would come shortly after, that would also take its place among the icons of horology. This lineage of watches that was to emerge from the hands of genius watchmaker, Louis Cottier, would, by the sheer superiority and audacity of its design, become the definitive reference for all watches with this particular complication. The watch being referred to, of course, is the Patek Philippe Worldtimer, a watch that made its first appearance in 1937, coming in two versions, in either a rectangular (ref. 515) or a round (ref. 542) case. Yet, the story for the Worldtimer is slightly different from that of the Perpetual Calendar and the Calatrava, as Patek Philippe did not make the first versions that were released in their name. 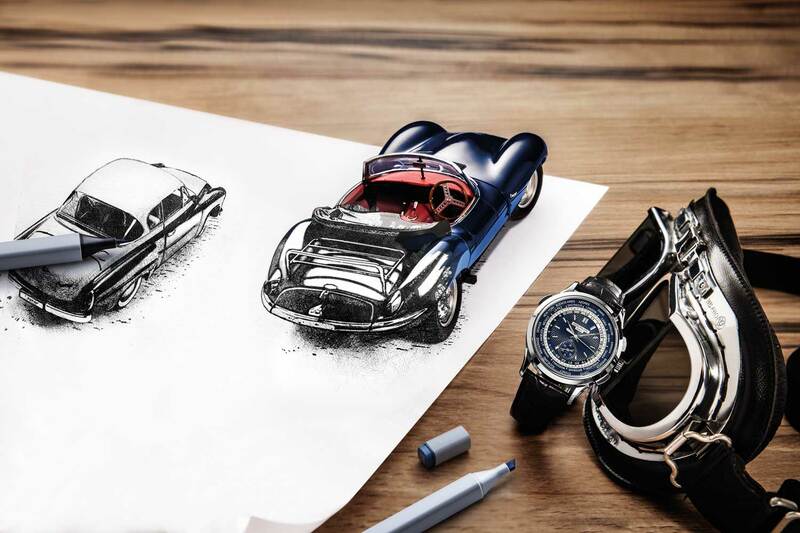 Instead, it was Patek Philippe and a handful of other brands who recognized the genius of Louis Cottier’s design idea, and who contracted him to make their Worldtimer watches in the 1930s. Yet it was only Patek Philippe who continued this early relationship, sustaining it for another two decades with updated versions of this remarkable watch, giving birth to a line of watches that can be traced, to this day, directly back to Louis Cottier. Surely then this is a major factor to consider in determining why, even in this modern era, the definitive Worldtimer of our time, even while it exists in a jungle of options is unquestioned. There is no debate. 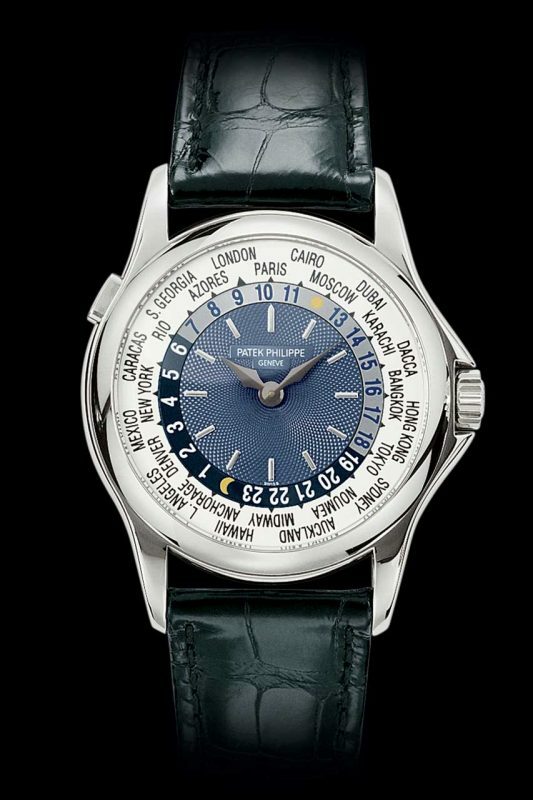 It has to be the Worldtimer from Patek Philippe, the ultimate reference for now and for all time. Louis Cottier was born on 28 September 1894 in Carouge, the son of a watchmaker specializing in watches and automata; he was surrounded by horology from the day he was born. The natural talents that he developed, coming in part from the influence of his early environment, led him to the Geneva school of horology under the instruction of famed Genevan watchmaker, Henry Hess. After graduating and working in a series of local factories, he decided to go into business for himself, starting a little atelier where he specialized in making clocks and watches for sale to private clients, and also developing new ideas in the process. History does not record the journey that Cottier took to come up with his Worldtimer design, but a clue exists that might point the way. 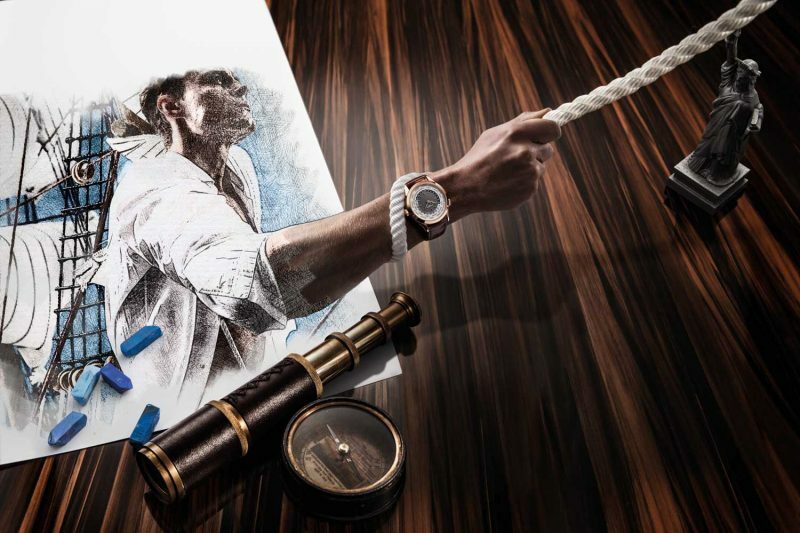 Earlier on in his career, he had worked on wristwatches without hands, and jumping-hour complications, so we know that he was interested in alternative ways to tell the time. Cottier probably worked on the problem with an intuitive understanding that the ingredients for what he wanted to achieve were already in existence. One of these, the global world-time standard of GMT, had already been agreed upon by many of the world’s nations in 1884, with the earth divided up by longitude into 24 separate time zones. It was not too far of a leap from this to have a rotating 24-hour ring, perhaps connected to the hour wheel of a normal movement, but slowed down to half the speed. This ring moving along in the duration of a day could then be used to tell the time against an outer ring, marked to representative cities in different time zones around the world. The idea, when it emerged, was at once elegant and utilitarian, solving the problem of cramming lots of information into the space of a watch dial, yet remained intuitive and easy to use. It was as they say, a sensible solution that really only needed a perceptive individual to connect the dots to realize and to bring to fruition in a watch. Indeed, such was the brilliant logic behind his method of world-time display that one wonders why it had not appeared before. When Louis Cottier came up with the first pocket watch in 1931 showcasing this design, it was right in the middle of the accelerating developments in aviation, which would allow man to find better and faster ways to move across multiple time zones easily. The design of this pocket watch was thus perfectly tailored to meet the needs of early travelers, who, in realizing the possibilities of its utility, seized upon it for the benefits it presented. The advantages are obvious when you look at the design, and respond to the way that its information is delivered. So clear is its function that one requires no instruction as to how it works. Furthermore, add to the basic design, a bi-colored 24-hour ring, with the hours between 18 to 6 in a darker tone, and those between 6 to 18 in a lighter tone, and one is able to quickly assess whether it is day or night in a specific time zone at a glance. The benefits of the design are something that even we can feel to this day, for no other type of complication is as unique as the Worldtimer in being able to display the time in all the time zones around the world at a glance. As an instrument of utility, it is unparalleled, yet it possesses another hidden talent: an ability to unlock the whimsical feelings that come in our relationship to one of life’s greatest pleasures — travel. 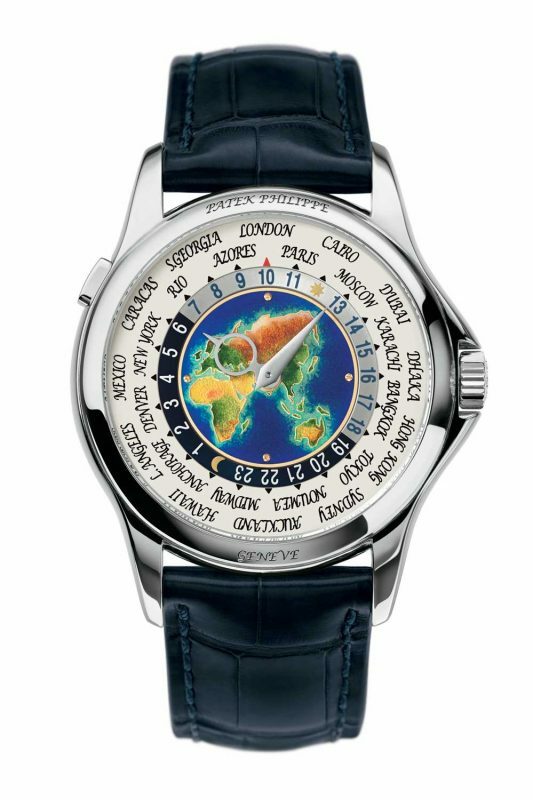 In this way, the key to the Worldtimer’s appeal comes from its design, for while the names of the cities on the dial relate to the various time zones they represent, they can, for most people, stand for the places that one might travel to in the future. On the wrist, as the watch accompanies you every day, the names of these cities stand like a daily reminder to the places that one can aspire to visiting, akin to the departure signboard that we see at airports. Indeed, the very names of these foreign places can inspire a wanderlust that is overwhelming. In addition, as one goes along the journey of being a watch collector, there is a point in time when world-time watches are considered for purchase precisely for their function. It’s easy to see why since many of life’s pleasures that we partake in, involve going to new places and novel experiences. What other watch, aside from a world-timer, can provide that shot of inspiration by its proximity, prompting a quick run to the airport to go somewhere far away? Indeed, Patek Philippe have realized the potential for whimsy as well, helped in part by the efficient use of space that the Worldtimer design affords, where most of the work of its complication is done at the outer edges of the dial. Here, the space that resides in the middle of the dial is an ideal canvas for an additional shot of wanderlust. Think of the special versions of the Worldtimer with cloisonné-enamel dials that have come from the collection since 2008, with the ref. 5131. The special cloisonné technique, which utilizes fine gold wire less than 0.5mm in diameter is bent to form a design, and fixed to a baseplate coated with a ground layer of enamel. The addition of compartments, or “cloisons”, is meant to separate the different elements of the design and allow them to remain visible in the finished piece. What has been depicted on such watches but the very places that we want to go or that are special to us? The first versions featured miniature maps of Asia and America in rose gold, and there has even been a pièce unique depicting Geneva Harbour. 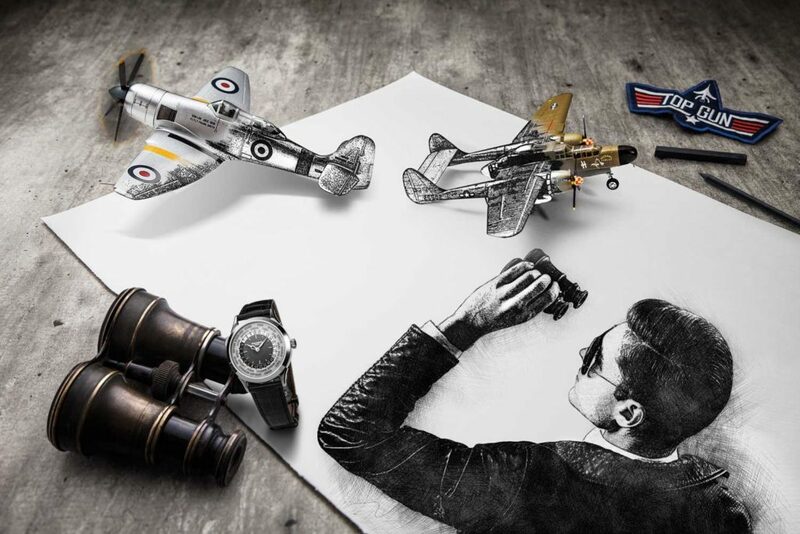 The possibilities in this regard are endless, but certainly those that have been created show the power of travel to inspire the depictions on these watches. Look at any world-time watch today and you see Louis Cottier’s imprint all over it. Why? Because the design is essentially perfect. With the world on one’s wrist and the ability to induce feelings of pleasure, this is a complication that is unequalled in its emotional power. Credit then to Patek Philippe who safeguarded an icon for the world, continuing in its tradition and refreshing it every now and then to become stronger than ever. As one of the several brands that first recognized the genius of Louis Cottier, the design, function and use of the subsequent Worldtimers since have been strongly linked to this heritage and now, when we trace the lineage of the World Time Chronograph and the two new Worldtimers that we have this year, the path leads us back directly to Louis Cottier himself. The Worldtimer fanatic was amply rewarded this year at Basel, with not just the highlight piece being a Worldtimer with another complication, a rare combination in and of itself, but also updated versions of their standard Worldtimers. 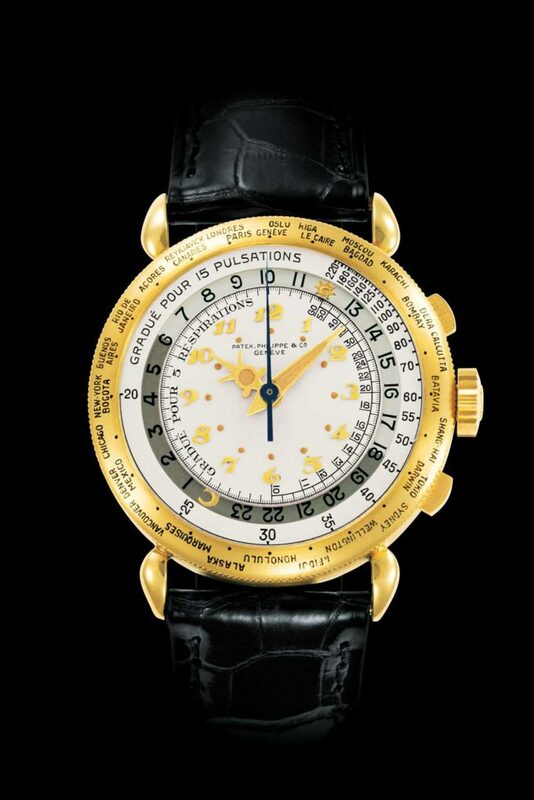 Patek Philippe World Time Chronograph (ref. 5930G) astonished onlookers with its design, for when first examined, the fact that it contained a chronograph was not immediately obvious. Instead, it was very clear that this watch was a Worldtimer first and foremost, with no compromise whatsoever to the aesthetics that we have come to appreciate, as well as for its functionality. Perhaps only on noting the two pushers on the right of the case, coupled with the long seconds hand as well as the 30-minute subdial at six o’clock, would it become obvious that there was an extra complication in this watch hiding in plain sight. Was this a brand-new combination of a Worldtimer and a chronograph complication in one watch that Patek Philippe had never done? No. 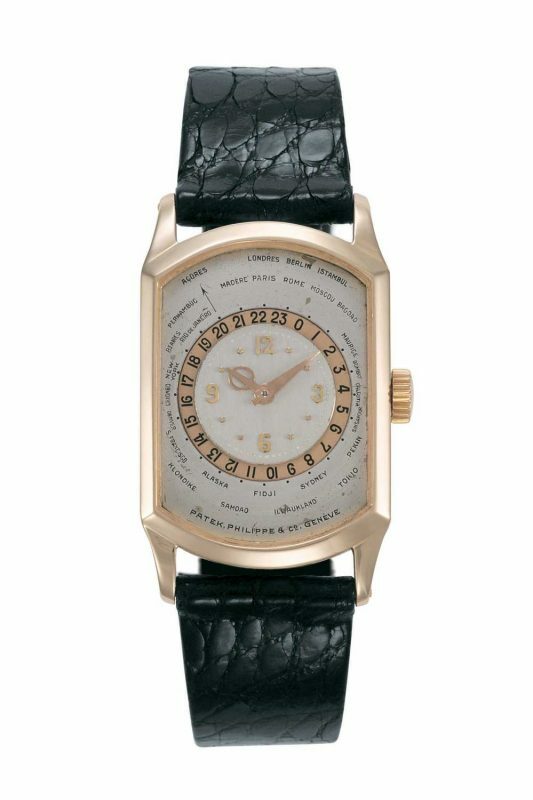 In fact, Patek Philippe had introduced a combination like this in 1940. However, unlike the one at Basel this year, which could be produced in some quantity, the one from 1940 was a unique piece. This sought-after watch, the World Time chronograph Ref. 1415-1 HU, was made for a Dr. P. Schmidt YG, and contained two pushers for start, stop and reset of the chronograph that could only time periods up to one minute. Why such a short amount of time? Well, the answer comes from what is inscribed on the dial. The words, “Gradue Pour 15 Pulsations”, informs us very clearly what this watch was intended for: it was a pulsograph meant for determining the heart rate of patients! Well then, a unique watch for a traveling doctor! Leaving aside the only other instance of a World Time Chronograph from Patek Philippe, what we have in this modern incarnation is still a combination of complications that is quite rare. Adding a chronograph to the Worldtimer does make the watch a touch more useful, and more importantly, it’s a showcase of how Patek Philippe undertook the feat while keeping the essential features of Louis Cottier’s design intact. Powering this watch is cal. CH 28-520 HU, a derivation of the base caliber CH 28-520 that was first used in 2006 in Patek’s first-ever in-house automatic chronograph, the annual-calendar chronograph ref. 5960P. However, some modifications had to be made to the base caliber in order to give space to the world-time rings. The most obvious is the position of the 30-minute counter at six o’clock, which was moved upwards in this watch. Not so obvious, however, from the outside were the modifications done in order to house the world-time and chronograph complications in a case that measures 39.5mm in diameter and a comparatively svelte 12mm thick. In fact, the achievements of this watch are numerous enough that one can place it and the standard Worldtimers side by side, and note very few obvious or objectionable differences. Even the pusher at 10 o’clock, a signature feature of the line introduced with the World Time Ref. 5110 in 2000 is present here. Rounding off the aesthetic features of this watch is a hand guilloché dial in blue, presenting a casual feel thoroughly in line with the pleasures that its owner will no doubt experience with this watch. In combination with the stunning World Time Chronograph, Patek Philippe also introduced the new generation of the flagship world-time model. Unlike the technical tour de force of the World Time Chronograph, the new ref. 5230 is all about the introduction of a series of aesthetic changes over the outgoing ref. 5130 model, adding a new dimension of character for a bolder and more elegant look. Placed side by side, the differences are obvious. The case of the ref. 5230 comes with a narrower bezel and winglet-style lugs that project a vintage feel, making the discreet case elements of the watch more pronounced and less rounded. Helping this impression is the crown as well, which stands alone and no longer has the protective guards that flowed from the lugs. A distinct change has also been made to the center of the dial with a hand-guilloché filigreed woven pattern inspired by a pocket watch on display at the Patek Philippe Museum. Differing from the previous version’s sunburst pattern, the dial of the new ref. 5230 now appears to be more organic and lively overall. The scissor hands that were from the previous model, which were first seen in the initial three versions of the Worldtimer, ref. 515, ref. 542 from 1937 and ref. 1415 from 1940, have been replaced with something not seen before. Now, the pierced hour hand is shaped in the silhouette of the Southern Cross constellation, with the minute hand featuring a lozenge-shaped contour. For that touch of contrast in the light, both hands have a sharp center ridge running between two beveled flanks, in contrast to the flatter style of the previous version. Functionally as well, to reflect changes in the world with regards to the cities on the dial, the new ref. 5230 shows Dubai instead of Riyadh at UTC +4 and Brisbane instead of Nouméa at UTC+10. Moscow has also now been relocated to UTC+3 from UTC+4. The current incarnation of the new World Time is available in white or rose gold, and has a slightly smaller diameter of 38.5mm, with a case thickness of 10.23mm. Wearability over the previous version is pretty much the same, but wrist presence is decidedly enhanced.